1. Frantz Fanon, Black Skin, White Masks (London: Grove Press, 1967), p. 82. 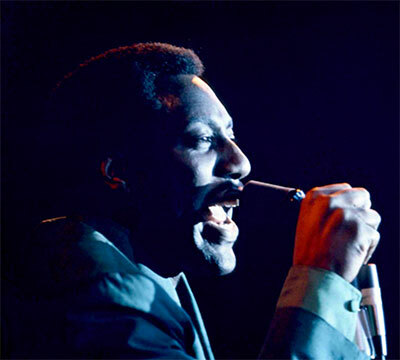 In 2014, BBC 4 screened Otis Redding: Soul Ambassador: a 60-minute documentary on the career of the soul legend. It was a very conventional, archival montage/talking head-insight piece, celebrating a formidable artist. The documentary’s stylistic blandness did not bother me; as an adoring fan, I was only too happy to sit back and enjoy the reflections on what was a short but major career. Imagine my surprise, then, when this blandness was interrupted momentarily by profound insight. This came from Lou Adler – the producer of the Monterey Pop music festival, of which Redding was a headline act. Adler’s words would come to excite a surprisingly rapid disentangling of my own sentiments about Redding as a figure of audio-visual pleasure. Raised as I was on rhythm and blues, his songs had always been there in my upbringing; but it was not until about five years ago, upon seeing Jean-Luc Godard’s use of ‘I’ve Been Loving You Too Long’, in Histoire(s) du cinéma (1999), that I came to realise the extent of its effect on me. Godard’s playful excavation of cinema’s own unconscious seemed to have instigated in me, the spectator, some sort of acknowledgment of my relation to Redding’s music. So I was delighted to hear Adler’s discussion: ‘Otis got to their soul. Bob Weir – of The Grateful Dead – said he thought he had seen God on stage that night’. Moments later, broaching the screening of the festival as a cinema release (as D. A. Pennebaker’s Monterey Pop ) he goes on to describe the spiritual effects of the cinematography: ‘…he’s shooting right into the light, and what he was hoping is that Otis would cover the light, so that he wouldn’t have that in his lens. Once he saw what he had, he stayed with it’. The combination of Redding’s presence and Pennebaker’s cinematography produces an image of iconicity that seems to transcend the realm of earthly celebrity and elevate Redding to some sacred place that ‘gets to our soul’. How to unpack some of the cultural, theoretical and ideological baggage implicit in such a perspective? To experience Monterey Pop today is to be transported not just to another time, but to another world. This under-appreciated documentary takes the pioneering music festival of 1967 and transforms its hedonistic spectacle into an aesthetic of pluralism, dynamism and relativism. Throughout, Pennebaker’s camera is alert to the changing moods of the diverse sets: from the feel-good opening of Scott McKenzie, to the pop sounds of The Mamas and the Papas, right through to its most fondly remembered scenes of Jimi Hendrix’s iconic ‘Wild Thing’ (featuring the famous, flamboyant destruction of his guitar). We are also treated to era-defining sets from the likes of Jefferson Airplane, Janis Joplin and, of course, Redding’s somewhat idiosyncratic headline act. In a site filled with counter-cultural rock and psychedelia, Redding’s southern soul offered an alternative dimension. Nevertheless – as we see in his high-octane performance of ‘Shake’ – to say the crowds were receptive to the change in sound would be an understatement. To Pennebaker’s credit, what the film manages so effectively to portray is the experiential enormity of the festival; this comes through strongest in these scenes – especially during ‘I’ve Been Loving You Too Long’. 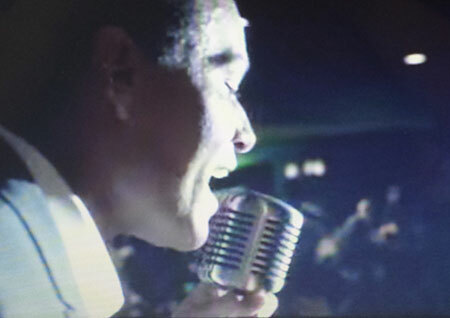 As the camera centres in on Redding – its slow zoom accompanying the prolonged note of the song’s first line – his face is framed and lit in such a way as to attain a deifying level of iconicity. From the moment he lets out that first, raw vowel, Monterey Pop stops being an experimental, concert documentary and approaches something like a religious experience. Redding becomes immortalised in this image. Months earlier, in Don’t Look Back (1967), Pennebaker had captured something of that intensity during Bob Dylan’s U.K. tour. The images of Dylan have a weighty presence; watching it today, as much as ever, one is well aware of how huge a part he played in the cultural imaginary of the 1960s. Yet, while Don’t Look Back is a fascinating piece of direct cinema – as enjoyable as it is insightful – nothing in the film matches the sublime effect produced by Pennebaker’s Redding close-ups. 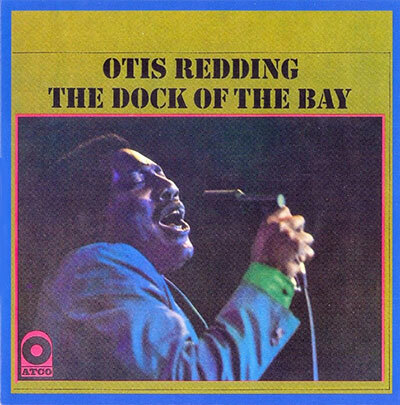 The immortalising effect of these images was as real as it was figurative, for when Redding died in a plane crash (aged just 26), Stax Records released a posthumous album (‘Dock of the Bay’) with a still from Monterey Pop on its cover. It is as though Pennebaker had foreseen the otherworldly quality of Redding’s performance and captured it accordingly, through a technique suitable to its deifying potential. In a short essay entitled ‘The Face of Garbo’, Roland Barthes described a similar deifying activity brought about by the images of Greta Garbo’s face, in films like Queen Christina (Rouben Mamoulian, 1933). that moment in cinema when capturing the human face still plunged audiences into the deepest ecstasy, when one literally lost oneself in a human image as one would in a philtre, when the face represented a kind of absolute state of the flesh, which could be neither reached nor renounced. (2) 2. Roland Barthes, ‘The Face of Garbo’, in Mythologies (London: Vintage, 1993) p. 57. The silent film was on its way to acquiring a psychological subtlety, a creative power almost unprecedented in the arts. Then the technological invention of the sound film burst upon the scene, with catastrophic force. (3) 3. Béla Balázs, Béla Balázs: Early Film Theorist, trans. E. Carter and R. Livingstone (London: Berghahn Books, 2010), p. 183. The subtlety favoured by Balázs relates to what he perceived as the close-up’s expression of humanity: ‘the facial expression is a human production that is also within human control’. (4) Both Balázs and Barthes (with his ‘absolute state of the flesh’) invest in the facial close-up a privileged relationship to the human condition – one that transcends common comprehension and attains a level of meaning reserved usually for something divine. Neither reachable nor renounceable, a Garbo (or, for Balázs, a Falconetti or Asta Nielsen) close-up gave the spectator something to abide by, to live for, to bow down and pray before. In spite of the historicity that Balázs attaches to (and Barthes implies with) the cinematic face, the images of Redding at Monterey certainly fit this idea of deification. Monterey provided a quasi-religious space of adoration, idealism and communion. Pennebaker’s visual techniques clearly make that connection between stage and altar, obstructing it only with an equal concern for expressing something of the event’s psychedelia, its light and colour. Yet this formal experimentation simply heightens the expressive euphoria – and, yes, in Barthes’ terms, the ‘deepest ecstasy’ – of the experience. Not so far from the close-ups described by Balázs and Barthes, then, we can trace a legacy of religiosity in the deifying aesthetics of Pennebaker’s Redding. This legacy pivots primarily on the term icon. The historical and theoretical content of the term introduces an illuminating narrative on the way stars like Garbo or Redding appear iconic. 4. Balázs, 2010, p. 102. The icon is not just a simple image, nor a decoration, nor even an illustration of Holy Scripture. It is something greater. It is an object of worship and an integral part of the liturgy. The Church sees in its holy image not simply one of the aspects of Orthodox teaching, but the expression of Orthodoxy in its totality, the expression of Orthodoxy as such. (5) 5. Leonid Ouspensky, Theology of the Icon. Vol. 1, trans. A. Gythiel (Crestwood: St. Vladimir’s Seminary Press, 1991), p. 8. Ouspensky articulates the significance of the icon to the Orthodox Church in a way that, in the contemporary visual culture of Pennebaker’s era, somehow appears both archaic and resonant. On the one hand, the diverse strands of post WWII American independent cinema (from the avant-garde of Deren and Brakhage to the observationalism of Pennebaker and Wiseman) would seem to constitute something profoundly iconoclastic. Here were artists intent on destroying the sanctified version of history, committed to reconfiguring (not reinforcing) the way America perceived itself. Yet, from the spiritual project of the American avant-garde to the ascetic and venerable images of ‘direct cinema’, these films all share a principle of co-opting ancient, sanctifying principles. Robert Drew sets a benchmark for this style in the John F. Kennedy campaign documentary, Primary (1960). The tightly framed close-ups of Kennedy exemplified the aesthetic significance of a politician whose success was viewed widely as related to his good looks and charisma. Kennedy had an undeniably stately presence prior to his election – Primary shows us this. Cast in the bright lights of large auditoriums and paparazzi cameras, he always wears a smile; his expression is subtle, his head and facial features barely moving. Those white teeth and sad eyes steal the frame when captured in close-up, immersing the spectator – and, one assumes, his discussant – in the speaking situation. Like Ouspensky’s Orthodox icons, the Kennedy of Primary stands for more than a representation of American politics – he is the expression of American politics ‘in its totality’. By bringing the spectator disproportionately close to the figure, the intensity of a close-up shows us this stateliness. In its excessive closeness, outside of our (or cinema’s) conventional viewing position, these close-ups also make us aware of how icons are made. Thus, Kennedy is made iconic, framed as if to stand for a venerable figure in American culture and the activity of veneration itself. Anna Grimshaw and Amanda Ravetz recognise the significance of Primary’s camerawork (notably undertaken by Albert Maysles), particularly the intimacy with faces: ‘attending to them without objectifying its subjects, rendering them at once recognizable and enigmatic’. (6) Grimshaw and Ravetz’s claim relates to the observational style in general, but it is also relevant to the facial close-ups’ construction of iconic imagery. From Drew and Maysles through to Pennebaker (who edited Primary), that place between familiarity and enigma reminds us of Barthes’ Garbo. It is significant also that this absolute immersion in the image could be realised in an image of a politician as much as in a quintessential Hollywood personality. 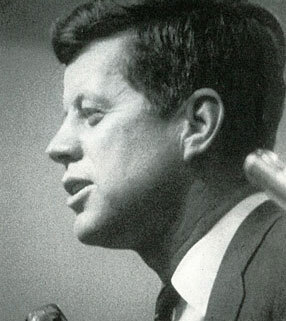 Utilising the close-up’s inherent ability to make icons of human faces, Kennedy’s image – like Redding’s – is comparable to Garbo’s because of their shared ancestry of iconic aesthetics. 6. Anna Grimshaw and Amanda Ravetz, Observational Cinema: Anthropology, Film, and the Exploration of Social Life (Bloomington: Indiana University Press, 2009), p. 30. In Richard Dyer’s words, ‘there is something inherent in the film medium that creates stars’. (7) Dyer argues that the close-up is one of the ways in which the moving image departs from previous artistic constructions of stardom, through the film image’s ‘inherent intimacy’. (8) While we may perceive ancient religious icons as in some way inviting us into a more empathic relationship with sacred figures, Dyer’s account of the close-up as a formal construction of stardom seems to negate the religiosity of the icon. Rather than focusing on the iconic close-up as deification, Dyer seeks to demystify it, urging us to ‘think of the relationships … between stars and specific instabilities, ambiguities and contradictions in the culture’. (9) This lineage (from religious art through to cinema) ultimately and unsurprisingly demonstrates an increasingly secular account of the iconic face: it shows, through popular visual culture, the public’s turn away from faith in the spiritual. Nevertheless, the icon of twentieth century image culture appears to retain many of the sanctifying facets of the Orthodox tradition. This would suggest that, in order to create an icon, an aesthetic derivative of sacred art is often mobilised. 7. Richard Dyer, Stars (London: BFI, 1979), p. 15. 11. Balázs, 2010, p. 104. Close-ups provide a privileged site of access to the most essential of human qualities. When Balázs claims that we have always had this essential face that cannot be manufactured, but that is obscured by our conscious expressions, he upturns Barthes’ notion of the mask. Barthes’ Garbo wore a façade that embodied ‘an archetype of the human face’, (12) suggesting that the empathic relationship between image and spectator is produced through physiognomic features. Balázs’ attention to the way conscious expressions obscure human similitude comes to produce a far more developed thesis. While Barthes is referring to the close-ups of Queen Christina (Rouben Mamoulian, 1933), it is the face alone, undefined by its framing, that he suggests produces an immersive encounter for the spectator. If we apply this perspective to a film like Persona (Ingmar Bergman, 1966), the faces of Alma and Elisabet are as immersive when framed in two-shot as they are in close-up. 12. Barthes, 1993, p. 57. While the confessionary nature – the two-shot dialogues between the two women – of Persona plays a pivotal role in its impact, the visual intensity derives primarily from its unforgiving close-ups. Thus, while I get completely lost in an image like that of Elisabet’s above, her face in other scenes may not have the same effect. This distinction is addressed by Balázs: the camera’s proximity to the face provides a privileged relationship to the inner life of the human. As such, when Redding is shown performing on stage flanked by his band, in wide shot, no such connection is made. When we gain such intimate proximity, it alters our relationship with the on-screen figure. In this moment, when Redding’s face is enshrined in the dark space of the stage – his facial features adapting to the vocal action, with flashes of stage and camera light intruding intermittently – we become immersed. The close-up offers more than the romantic situation Redding’s song invites; it is a moment of human identification. But what is lost in this approach? What is missing in this equation of Redding’s face with something either godly or essentially human? Pennebaker’s objectivism produces a relativistic aesthetic approach; his camera is always responsive to the situation in which it finds itself, the style is always being shaped by each particular performance. He does this regularly in artistic environments like in Don’t Look Back and Rockaby (1983), in the political environment of The War Room (1993), even in the kitchen of Kings of Pastry (2009). There is a historical specificity of Monterey Pop, however, that jeopardises the form of humanistic (both spiritual and secular) spectatorship. How do we negotiate the indisputably raced element of these images? Pennebaker’s visual responsiveness produces something very different in the night-set images of Redding (indeed, Hendrix too) than in the daytime performances of Simon and Garfunkel. A combination of his black skin, the night shoot, the disparately located and differently coloured artificial light sources: one key reason this performance is so visually tantalising is the relationship between the film technology and the black body it comes to reproduce. 13. Richard Dyer, White (London and New York: Routledge, 1997), p. 89. 14. As Gertrud Koch describes Balázs’ philosophy in her article, ‘Béla Balázs: The Physiognomy of Things’, New German Critique (Winter, 1987), pp. 167-177. 15. Brian Winston, ‘A Whole Technology of Dyeing: A Note on Ideology and the Apparatus of the Chromatic Moving Image’, Daedalus, Vol. 114, no. 4 (Fall, 1985), p. 107. In its striking reproduction of Redding’s face, Monterey Pop cannot really be viewed in quite the same way; rather, an interesting contradiction occurs in the collision between the objectivism of the direct cinema aesthetic and the scenario’s play of dark and light. By bringing us closer to the physiology of the subject, the close-up reinforces this racial hierarchy of image quality – black skin cannot appear even close to how it is in reality. Yet, Pennebaker persists, staying close, never using ‘quality’ as a guide, allowing the chaotic interaction of colour and light to produce an image more intense and more affective than the naturalistic augmentation of lighting could possibly allow. Thus, in its ‘direct’ appropriation of the realist ontology to formalist ends, Monterey Pop reimagines the way technological hierarchies of quality work in favour of white bodies. The ‘flawed’ reproduction of blackness is upturned, producing a visual creativity that allows for a far deeper aesthetic experience. This formal innovation reinforces the deifying effects described earlier: Redding’s face is framed in such a way as to construct an image of him as an icon, beyond the lived experience of mere mortal spectators. So strong is the image’s appeal that it seems to have influenced contemporary filmmakers. In some other recent film biopics that attempt to capture the iconic presence of the black icon, the same light-affected close-up recurs. One particularly striking example occurs in Michael Mann’s Ali (2002). In a fascinating moment of anachronism, Sam Cooke (the single biggest influence on Redding’s music, many of whose own songs he covered) is shown performing in the opening sequence, framed in ways strikingly similar to the images shot by Pennebaker. Ali jumps between scenes of Muhammad Ali training, fighting, as a child, walking to the back of a bus, and Malcolm X speaking, all cut to the sound of Sam Cooke and his band lingering over the opening riff of ‘Bring it on Home to Me’. A momentum builds as Ali trains for ‘Rumble in the Jungle’, and Cooke’s song is used to frame a visceral socio-historical atmosphere. Colour is again used in a glorifying way, bathing the superstar in that harsh light which provides a sense of iconicity. 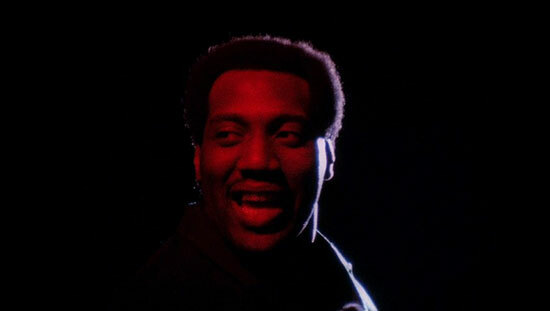 Shortly after Ali’s portrayal of Sam Cooke, Taylor Hackford’s Ray (2004) mobilised the effects of light-on-dark throughout. The movie’s promotional material also notably foregrounded this aesthetic. 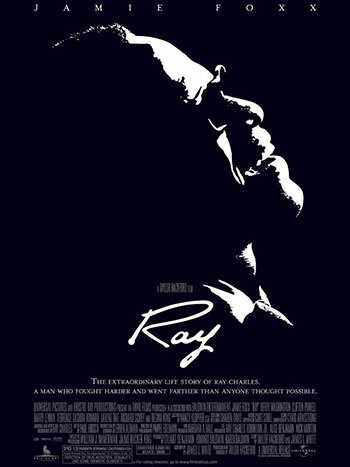 Relying solely on the play between black and white, the poster’s visual asceticism seems to complement Ray Charles’ own blindness; but it also continues the effect of light-on-dark. The poster’s use of this technique threatens to become cosmetic and depthless. In this most basic of reconstructions, the flat, white-shaded sketch of Charles foregrounds the potentially superficial nature of such images. An ambivalent racial narrative is produced: between the close-up of the black icon as deifying and as exoticising. Rather than settling on either of these, I think it is important to recognise how both exist as potentialities. In its ambivalence, potentialising both utopian and racist perspectives, Monterey Pop exhibits the dual character of how close-ups can be perceived. Drawing in the spectator with the emotional connection to that love about which Redding testifies, there is something of the dominant approach to the cinematic close-up. However, by placing the filmed subject under such a scrutinising light, the Redding close-ups also carry an objectifying quality. We experience a highly literal translation of Fanon’s testimony: ‘the glances of the other fixed me there, in the sense in which a chemical solution is fixed by a dye’. Heavy, intrusive light foregrounds the artifice of the image, undermining the figure’s interiority and, indeed, its subjectivity: it becomes no more than a surface for the play of colour and light. In its objectifying effect on the body, this latter perspective brings to mind the visual anthropologies of Robert Flaherty, Margaret Mead and Gregory Bateson. The images in works like Nanook of the North (1922) and Trance and Dance in Bali (Margaret Mead and Gregory Bateson, 1952) – shot by Western filmmakers in a period of high imperialism – attempt to decode the exotic practices of the Orient. Described by Jane Chapman as a ‘taxidermic mode of representation’, (17) the anthropological approach to filming the face flattens the subject to mere image, dissolving the possibility of subjectivity and reconstructing it in a cosmetic way. The anthropologist attempts to access a higher plane of authenticity. In its unerring gaze on the event, Monterey Pop, in turn, contains this aesthetic principle. However, when we take into account the technological racism described by Dyer and Winston, the exoticism of the gaze is the inevitable side effect of equating filmic observation with authenticity. 17. Jane Chapman, Issues in Contemporary Documentary (Cambridge and Malden, 2009), p. 34. 18. Special thanks to Tina Kendall for her support and insight. © James Harvey-Davitt & LOLA, December 2015.